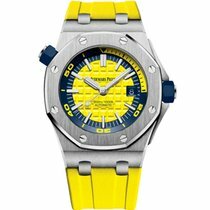 Perfect legibility in and out of the water with this fun and ‘funky’ new Royal Oak Offshore Diver. 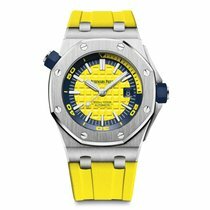 The Royal Offshore’s signature “Méga Tapisserie” checkerboard patterned dial is in bright yellow, harmoniously balanced with a blue rotating inner bezel. 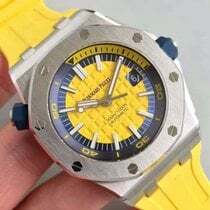 Dial - yellow dial with “Méga Tapisserie” pattern, white gold applied hour-markers and Royal Oak hands with luminescent coating, blue rotating inner bezel with diving scale and zone from 60 to 15 minutes in yellow.